Brig. Gen. Wayne R. Monteith is the Commander, 45th Space Wing; and Director, Eastern Range, Patrick Air Force Base, Florida. He leads over 13,000 military, DoD civilian and contractor personnel responsible for the processing and launching of U.S. government and commercial satellites from Cape Canaveral Air Force Station, Florida. General Monteith is also the final approval authority for all launches on the Eastern Range, a 15-million-square-mile area which supports an average of 15 launches per year aboard Delta, Atlas, Falcon, Navy and emerging launch vehicles. In addition, he manages wing launch and range infrastructure supporting NASA, commercial and missile test missions. Prior to assuming his current position, General Monteith served as the Senior Military Assistant to the Secretary of the Air Force. General Monteith has served as a Peacekeeper intercontinental ballistic missile (ICBM) combat crew member, senior ICBM standardization and evaluation crew commander, ICBM instructor, chief ICBM flight testing, and command lead for a major space acquisition program. He commanded the Air Force’s only ICBM combat crew training squadron and the 50th Space Wing where he led more than 5,300 military, DoD civilians and contractor personnel serving at 14 operating locations worldwide in support of more than 170 communications, navigation, weather and surveillance satellites with their associated systems valued at more than $66 billion. General Monteith has also served in various special duty capacities including major command, combatant command, Headquarters U.S. Air Force and Office of the Secretary of Defense staff positions. He earned the Master Missile Operations designation and is a Command Space Professional. 1995 Squadron Officer School, Maxwell AFB, Ala.
2007 Master of Science in National Resource Strategy, Eisenhower School for National Security and Resource Strategy (formerly Industrial College of the Armed Forces), Ft. McNair, Washington, D.C.
2010 Leadership Development Program, Center for Creative Leadership, Colorado Springs, Colo.
1. November 1989 – March 1990, Student, Distinguished Graduate, Undergraduate Missile Training, 4315th Combat Crew Training Squadron, Vandenberg AFB, Calif.
2. March 1990 – April 1994, Peacekeeper Intercontinental Ballistic Missile Combat Crew, Stan/Eval, Instructor, and Senior Combat Crew Evaluator, 400th Strategic Missile Squadron and 90th Operations Group, F. E. Warren AFB, Wyo. 3. April 1994 – September 1994, ICBM Officer Code Controller, 90th Operations Support Squadron, F. E. Warren AFB, Wyo. 4. September 1994 – September 1997, ICBM Test Operations Director and Chief, ICBM Flight Testing (Top Hand), 576th Flight Test Squadron, Vandenberg AFB, Calif.
5. September 1997 – November 2000, Command Lead, Range Standardization and Automation, Phase I, and Chief, Space Launch Programs, Headquarters Air Force Space Command, Peterson AFB, Colo.
6. November 2000 – April 2001, Executive Officer to the Director of Staff, Headquarters Air Force Space Command, Peterson AFB, Colo.
7. April 2001 – July 2003, Aide-de-Camp to the Commander-in-Chief, North American Aerospace Defense Command; Commander, U.S. Space Command, U.S. Northern Command and Air Force Space Command, Peterson AFB, Colo.
8. July 2003 – July 2004, Deputy Division Chief, Space Superiority Division, Plans and Programs Directorate, Headquarters U.S. Air Force, Washington, D.C.
9. July 2004 – July 2006, Commander, 392nd Training Squadron, Vandenberg AFB, Calif.
10. August 2006 – June 2007, Student, Eisenhower School for National Security and Resource Strategy (formerly Industrial College of the Armed Forces), Ft. McNair, Washington, D.C.
11. June 2007 – July 2008, Director, Navigation Warfare, Space Programs and Policy, Office of the Secretary of Defense, Networks and Information Integration, Washington, D.C.
12. July 2008 – August 2009, Vice Commander, 21st Space Wing, Peterson AFB, Colo.
13. August 2009 – August 2011, Commander, 50th Space Wing, Schriever AFB Colo.
14. September 2011 – May 2013, Deputy Director, DoD Executive Agent for Space Staff and Assistant Deputy Under Secretary of the Air Force (Space), Washington, D.C.
15. May 2013 – June 2014, Senior Military Assistant to the Under Secretary of the Air Force, Washington, D.C.
16. June 2014 – July 2015, Senior Military Assistant to the Secretary of the Air Force, Washington, D.C.
17. 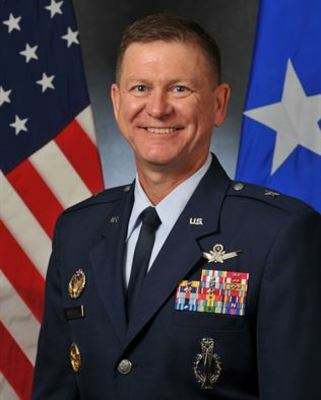 August 2015 – present, Commander, 45th Space Wing; and Director, Eastern Range, Patrick AFB, Fla.